Film scholars have rightly become sceptical about the value of books published under the imprint of an American academic institution. Too often we encounter yet another in-house doctoral dissertation dutifully displaying familiarity with current theoretical issues and mechanically deploying the grid on the chosen field of research. The realists among us know that most of these publications are discursive exercises tailored to the tenured track in the institution, and that they have little to say that is new or interesting. It is therefore a pleasant surprise to come across a publication that betrays not just academic credentials but personal conviction and a passionate commitment to its subject. Mark Nornes has devoted many years to his research but he has also given years of service to the documentary cause. As a programmer at the Yamagata International Documentary Film Festival, he has contributed to the dissemination and discussion of the Japanese documentary, and to a comparative analysis of Japanese and American wartime propaganda films. He contributed one of the best chapters to Mick Broderick’s book on hibakusha (1) cinema, disentangling the labyrinthine threads of the troubled history of the production, suppression and exhibition of the Nichiei documentary on the effects of the atomic bomb on Hiroshima and Nagasaki. He has not only viewed numerous Japanese non-fiction films (amateur and professional) made between 1900 and 1950, he has also zealously researched Japanese and American government and military archives, secret police files, industrial and studio records, War Trials testimonies, and a vast number of short-lived pre-war Japanese film magazines, which he has translated and analysed. His very intensive and extensive research has enabled him to situate the films within their economic, political, social and intellectual context; to make us understand the pressures under which they were made; and to invite us to question more than a few entrenched attitudes. The first myth that Nornes debunks is the view that Japanese film criticism is neither interesting nor worthy of respect. This canard was first propounded by Anderson and Richie, in their influential pioneering work (2); and was not questioned by Burch, in his re-writing of Japanese film history from a theoretical perspective (3), though he was otherwise critical of their work. With extensive documentation and discussion, Nornes demonstrates that very sophisticated debates on film issues were conducted and published in Japanese journals throughout the 1930s. These debates displayed familiarity with avant-garde and radical film theories and practices from France, Germany, Soviet Russia and Britain; and a high level of intellectual engagement with issues of realism, culture, art and politics. In my own research on Japanese fiction films of the ’30s, I too have encountered very sophisticated criticism in the pages of contemporary Japanese film journals, leading me to concur with Nornes and to conclude that the high level of debate and intense critical activity were very influential and contributed to the flowering of Japanese film art in the 1930s. The second myth that Nornes debunks is the view that Japanese documentary and fiction functioned as separate and distinct categories. He demonstrates that the earliest actuality films employed dramatic re-enactment and other fictional elements while the earliest fiction films were often documentation of actual theatrical performances. More significantly, perhaps, he shows that there was a blending of the two forms in the wartime cinema, with the fiction film incorporating long documentary sequences of military training and action and the documentary incorporating elements of melodrama and other fictional devices. Not only the war movie set at the battlefront, but also the home front propaganda movie (such as Kurosawa’s The most beautiful, 1944) incorporated long sequences of documentary material and was influenced by documentary form. Nornes furthermore demonstrates institutional crossovers, such as the same studio (e.g. Toho) producing both fictional and documentary features; and the same cameraman crossing between the two (e.g. Miki Shigeru, who shot many of Mizoguchi’s movies and also shot documentary features for Toho in China). The other myths punctured by Nornes are directed more particularly at the selective – or suppressed – memory of Japanese film critics and leftist intellectuals, who have represented the period from 1931 to 1945 as a period of total suppression and oppression and posed a sharp divide between it and the periods before and after it. Nornes stresses the continuities rather than the breaks, showing how many former and later radical filmmakers worked in the wartime industry, and employed the same or similar methods of imparting ideology. National solidarity, like class solidarity before and after, was imaged in montages of masses of people moving in unison, carrying flags and singing songs, inspired by the inflammatory oratory of their leaders and underlined by the inflammatory use of inter-titles. Through the practice of tenko, public avowal of apostasy or conversion made under state pressure, dissidents were coopted by and collaborated with the state, after release from prison, or at best ceased to publicly criticise national policies. Nornes argues that there was a hidden discourse of protest and discontent, which occasionally surfaced, and which is most perceptible in the criticism of Iwasaki Akira and the documentary filmmaking of Kamei Fumio, a radical filmmaker who was trained in Soviet Russia. They were both imprisoned but later returned to the workforce and lived out the war. 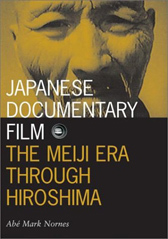 Though it was a period of suppression of leftist activism, and of heavy-handed censorship, it was also a period of great productivity and experimentation in the cinema, especially in the documentary, in part because the state endowed status and awarded privileges to the non-fiction cinema – especially those bunka eiga (cultural films, comparable to the German Kulturfilme) and documentaries recommended by the Ministry of Education – which were denied to the fiction film industry because the latter was always suspected of being motivated by vulgar greed rather than a noble desire to enlighten the public. All these issues are explored in extensive and intensive detail by Nornes, along with a listing and discussion of vast numbers of non-fiction films (actualities, news films and documentaries) produced over the half century he covers. Unfortunately, most of these films (especially the early ones) are no longer extant and so in many cases he has had to rely on the accounts and memoirs of contemporary critics, filmmakers, bureaucrats and industry personnel, being personally able to view and analyse only a small percentage of the total production. He gives particularly close attention to the militaristic 1933 Hijoji Nippon (Japan in a Time of Crisis, produced by Osaka Mainichi newspaper, narrated by the Minister of the Army, General Araki, and readily accessible in the Washington Archives, as it was an exhibit at the Tokyo War Trials) as an embryonic example of the hard-line nationalist documentary and Kamei’s long suppressed Tatakau Heitai (Fighting Soldiers, 1939, a Toho documentary production shot by Miki Shigeru in China), as the most impressive example of a transgressive war documentary, one in which the hidden discourse of discontent surfaces. He bemoans the widespread western critical neglect of this Kamei film, which Japanese critics value highly and which Andrei Sokurov has rated the best Japanese film of the century (see p. 149), and attributes the unwarranted critical neglect of Kamei’s work in general to the politically-motivated dismissive attitude of Anderson and Richie, and to the general neglect of non-western documentary by western scholars and critics. With his passionate commitment and enthusiasm, his breadth of scholarship and close attention to Japanese records, writings and voices, Nornes has performed sterling service in the cause of remedying this neglect. Joseph Anderson and Donald Richie, The Japanese Film: Art and Industry, Princeton University Press, 1981, p 423. The original version of this work was first published in 1959 by Tuttle.